With three trips to O’ahu we still had not ventured to the famed North Shore of the most touristic Hawaiian island. So thought, what better way to do it then by plane, on the first flights with my pilot boyfriend. Hawaii is one of the ultimate destinations to see by plane or helicopter, as some of the island locations are only accessible by air. From the lush and jagged mountains, valleys you could easily get lost in, the highest sea cliffs in the world to the aqua toned reefs, an aerial view of the islands is nothing short of spectacular. 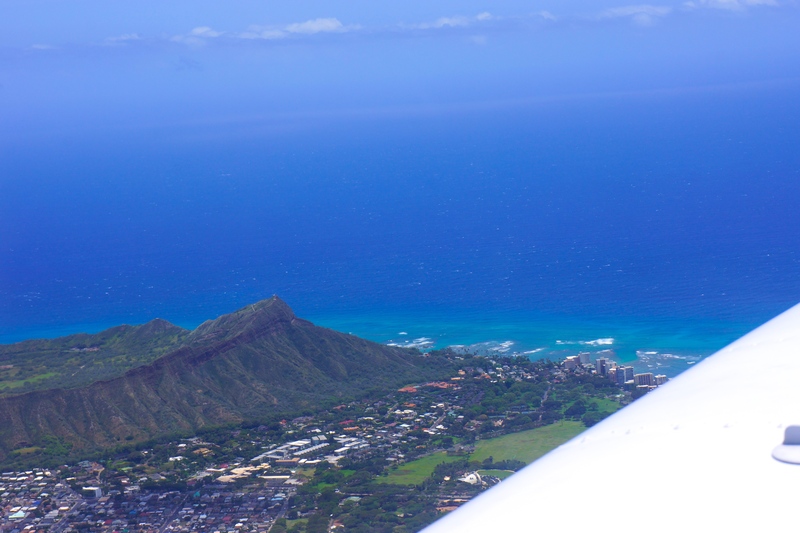 We circled the island of O’ahu and to soak in the North Shore from a different perspective including surfing haven Waimea Bay and the perfectly positioned Turtle Bay Resort. True to the Hawaiian guides, the North Shore is quite a contrast to the abundance of hotels and beach front resorts in bustling Waikiki. Across the Kaiwi Channel, on the more reserved and untouched island of Moloka’i, are the sea cliffs that rise between 1,100 to 1,200 metres and feature in Jurassic Park III’s opening scenes. As we flew alongside the epic cliffs, you are completely in awe as you begin to comprehend the scale of the cliffs in comparison to a person.